Remembering Her stands holding a poppy in one hand representing the fond memory of her father while holding out a hand towards the memory of her mother. 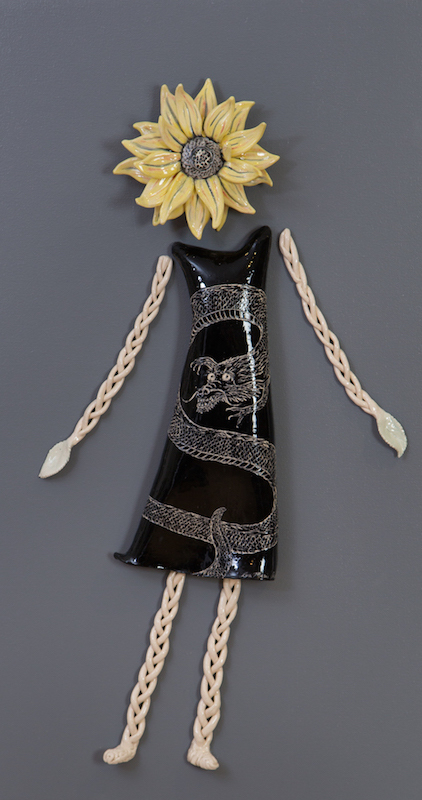 The sunflower represents the strong spirit that holds the memories of her parents near and dear to her heart. 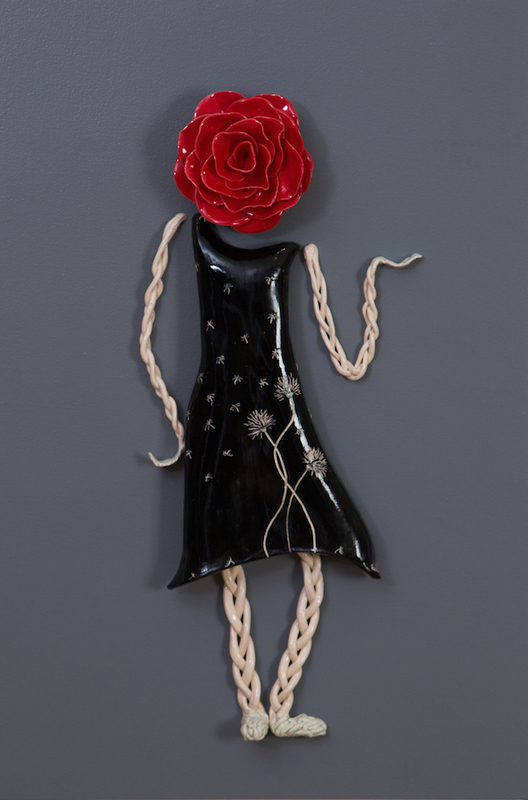 The black swirling line connects her current living spirit to the memories of her mom and dad shown as a carved poppy. The little curvy lines surrounding the poppy are the many different memories that swirl through her mind as she thinks of them. They have become a permanent part of her life through the influence they had when they were living and through the strong memories that still live with her today. Similarities Series Remembrance Rose stands thoughtfully and still as the memories of her loved ones flow through her mind. 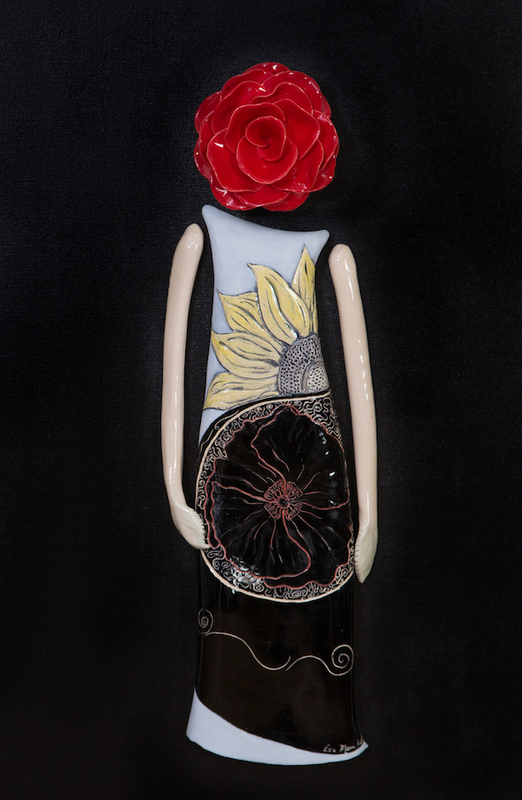 The bright sunflower represents her living a vibrant life influenced and guided by those who have already died. Their memory is shown through the poppy that it surrounded by the many memories made while they were still living. Those memories and influence live on through the many people they touched. Honie Sunflower stands calmly as she clutches her husband and her mother-in-law close to her heart. Both of whom she has taken great care to be sure their lives are fulfilling and comfortable through hardships represented by the raindrops. Honie’s three children dance as hearts amongst the strong characteristics that make Honie unique and special. The larkspur sits at the top of the dress symbolizing a strong spirit. The pink tulip speaks of a caring nature while the hydrangea highlights perseverance. Honie’s ability to bring healing, protection and affection is reflected in the aloe flower. At the root of all of these traits is the violet which contains the loyalty, devotion, and faithfulness Honie uses as she lives out her life each day despite the raindrops of difficulties that come in life. 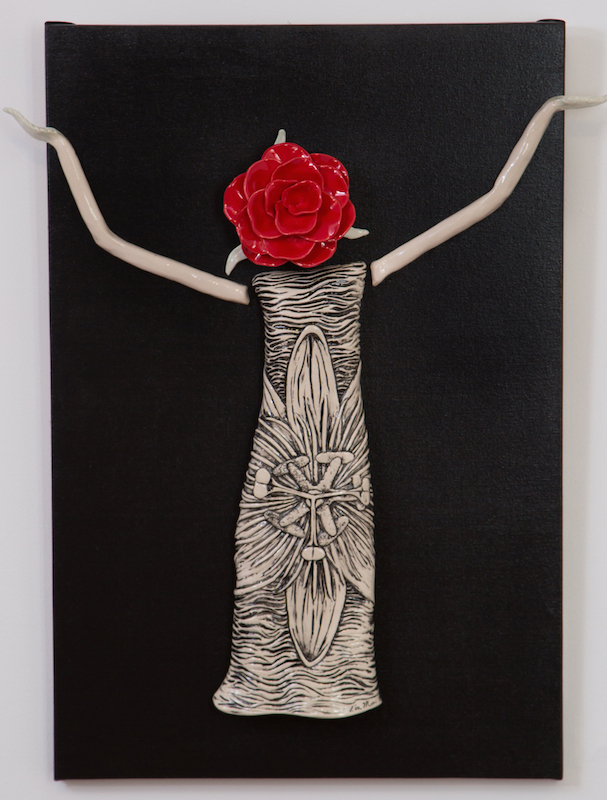 Similarities Series Laura Rose is a celebration of a woman who approaches life with courage and strength signified by the garlic flower. She has strength of character (gladiolas) to get through hardships in life with dignity and decisiveness. Her valor (iris) and endurance (cactus) have been an example to her daughter and will be characteristics she cherished and nourishes forever. 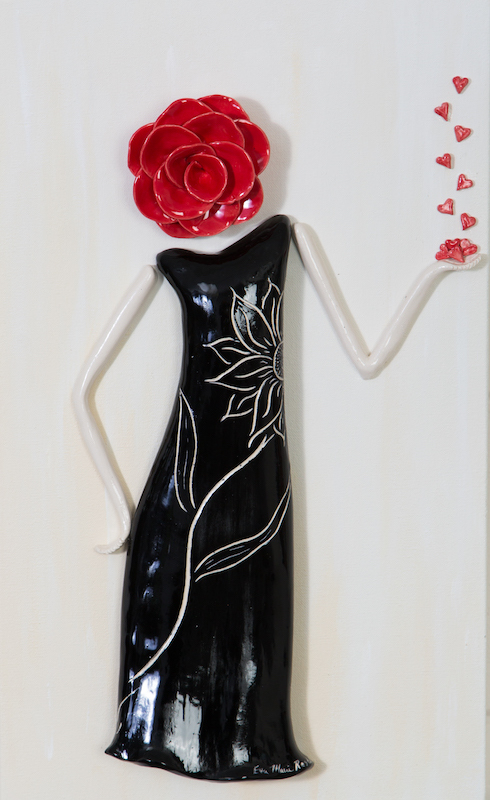 The red rose head represents the respect she has earned by living a purposeful and courageous life. A Japanese dragon symbolizes wealth and success in the form of education and fullness of life. Graduation marks the beginning of ones path towards such goals. Graduation marks the beginning of ones individual path towards finding how to use ones talents to add to the world and make it a better place. A first day anywhere leaves us with wide open eyes and a bit reserved. She holds herself in a gentle protective stance with her emotions of wide open owl eyes carved on her dress. Family Rose holds four hearts in her hand representing her children while admiring her grandchildren shown through the dancing hearts. They are each unique with their own vision. She is proud of her children and grandchildren as she relishes their presence. Three dandelions dance on the dress of Trouble Rose. We all have a story of when we have caused fun trouble with friends – the kind that does not harm anyone and we laugh about it to this day. Although our stories are different, we share the funny stories that make you smile. This piece makes me think of a particular story with my little sister when we were about 8 years old and I laugh every time I look at this piece. She brings me many smiles. 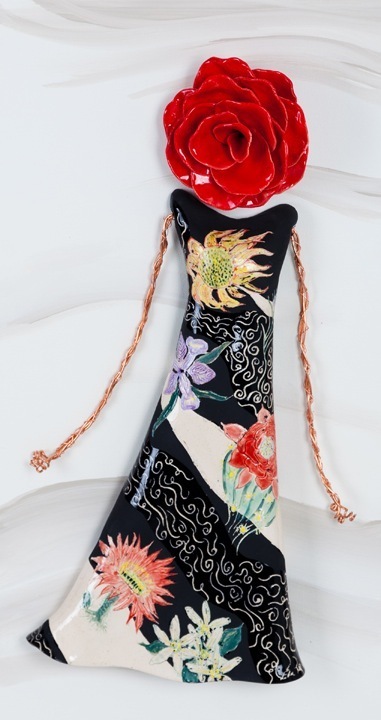 Laura Rose is a celebration of a woman who approaches life with courage and strength signified by the garlic flower. She has strength of character (gladiolas) to get through hardships in life with dignity and decisiveness. Her valor (iris) and endurance (cactus) have been an example to her daughter and will be characteristics she cherished and nourishes forever. 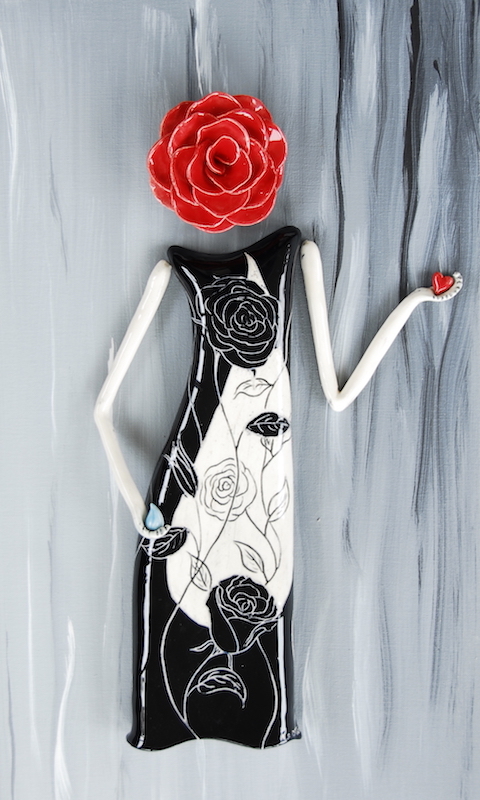 The red rose head represents the respect she has earned by living a purposeful and courageous life. Sue Rose is a celebration of Sue Herr’s life. She is lovingly holding the hearts of her family in her hands as all the love she gave them continues to give them strength and guidance. 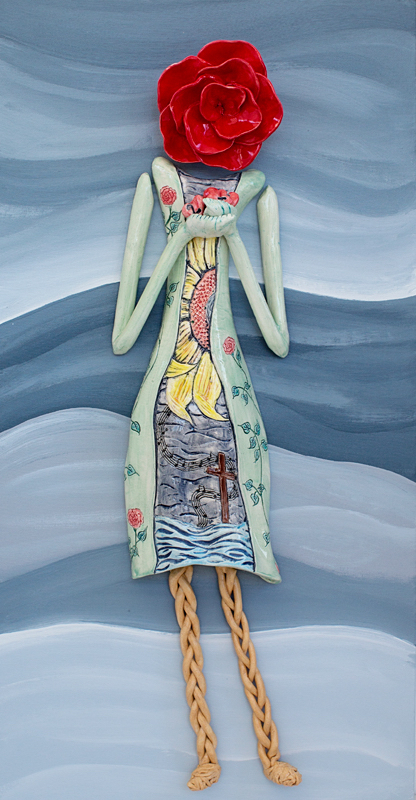 The water represents the family’s love of water as well as the living water with the cross rising out of it as a symbol of her love of Jesus. The music notes wrapping through the background stands for all the instruments her family played which she enjoyed and supported throughout her life. 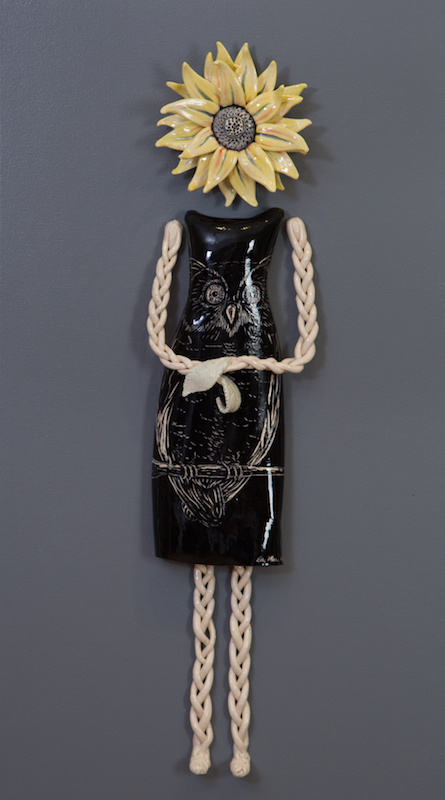 The bright sunflower symbolizes her strong spirit and her goodness. Her spirit lives on in the many lives she touched. The rose vines on the jacket represent all the support Sue received during her treatment. On the bottom right corner of her dress there is a pink ribbon with a hole in the middle. The hole respects that despite the difficult process of battling cancer, Sue was beautiful inside and out. Sue Rose is a gift to the family from loving colleagues. Susan Rose stands with two raindrops in her hands representing her two lovingly raised sons and three joyous grandchildren, respectively. 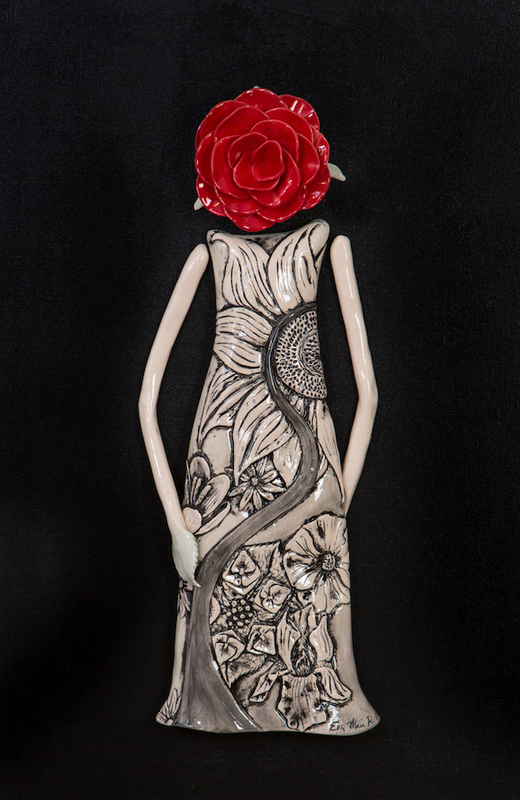 The large sunflower carved on Susan’s dress stands for her inner strength that she has drawn upon throughout her life, particularly during the difficult times. Music notes float in the background as music plays an important part of her life. The notes themselves are fun message from her son, Mike. “Eyes of the World” by the Grateful Dead is one of his old favorites that will bring a smile to his mother’s face. Daisies in the piece are a special flower for Susan. They represent beauty, the beauty in which she lives her life and the beauty that she brings to others in her life. Annie Rose is captured mid-step and in thought with a caring butterfly keeping watch representing her mother. 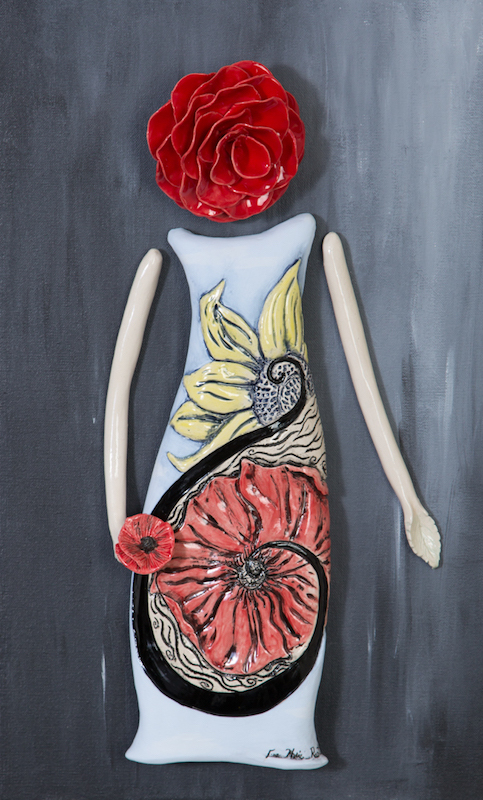 Annie is breathing in her poppy flower which represents her father whose memory brings her inspiration and strength. Each flower on her dress also carries significance. 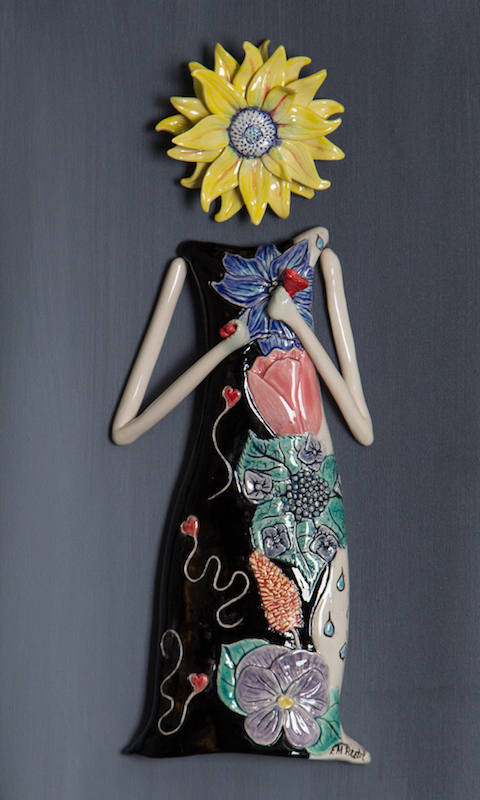 The sunflower carved on her dress signifies Annie’s vibrancy of spirit through good times and bad. The blue gladiolus stands for her strength of character and the pink violet intimates her faithfulness. Her perseverance in all areas of life is symbolized through the purple hydrangea while the black-eyed susans denote the encouragement she receives from each of her siblings. The pink tulips point to the caring she gets from her many relatives. 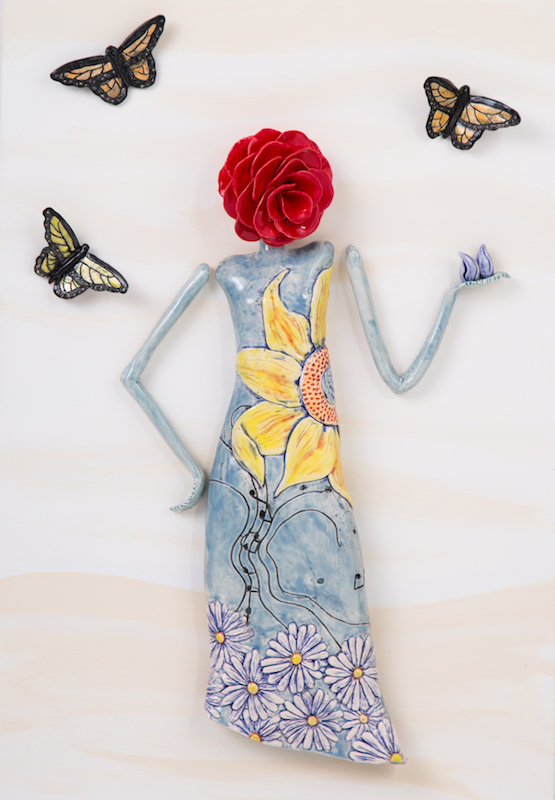 In the background, a rose vine gracefully winds through the flowers highlighting Annie’s beautiful journey in life. 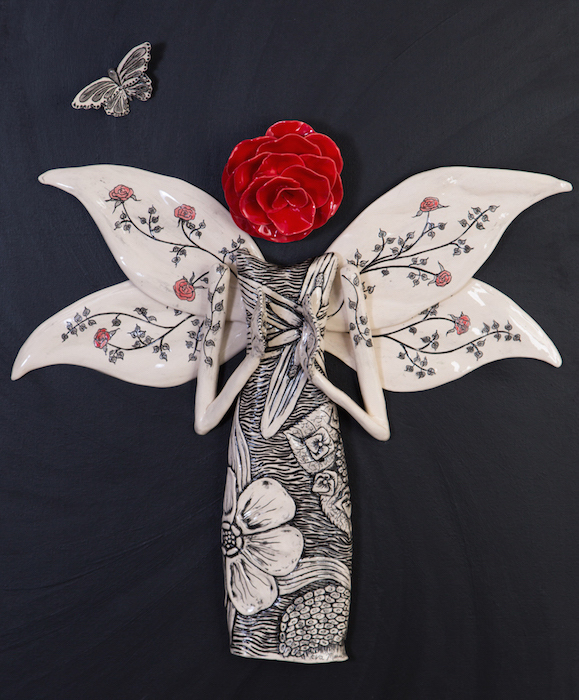 Joyful Angel represents the spirit of a loved one who has left a permanent imprint on family members left behind. The flowers on her dress represent Hope (Star of Bethlehem), Perseverance (Hydrangea), Remembrance (Forget-Me-Not), and Festivity (Baby’s Breath). Joyful Angel represents the life lived and the ideals passed onto family. The family can now use these lessons in their own lives as they unfold. A passion flower covers her dress and her arms are outstretched showing the feeling one has when they put their energies towards their passion and make a difference in the world. It is a glorious convergence of energy and goodness that brings one a sense of great peace and happiness. 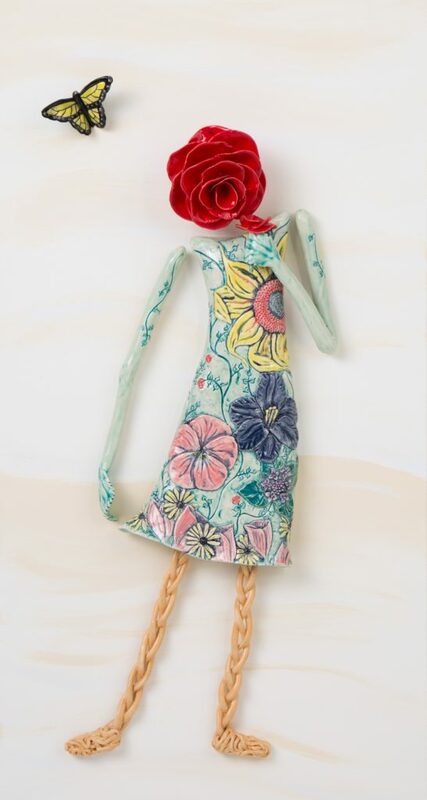 A sunflower radiates the energy of spirit and compassion that this Rose Lady has given throughout life. The long winding strand that goes from dark to light signifies the passing of time. On the left side of the life strand is a crocus symbolizing youthful gladness with the daisies showing the innocence that comes with youth. The hydrangea represents the perseverance that carried her through breast cancer while the iris highlights the wisdom and courage gained through the ups and downs of life. And finally, the poppy stands for the sincere remembrance of those that have passed before her. This Rose continues to live a beautiful life with many good memories to carry along the way. Riverside Rose celebrates the beauty of the river, bridges and park. 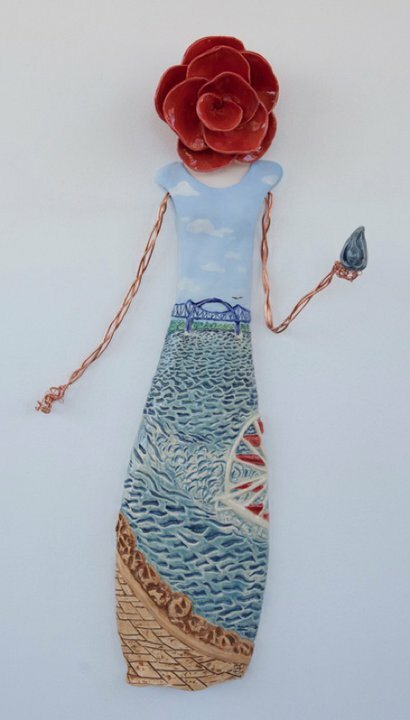 She holds a drop of water symbolizing the bountiful goodness found in La Crosse, WI. La Crosse is a gift to all who come through, she has many sides and many gifts, just like the people who live here. May we each remember to celebrate our land and our people, all of our people. The La Crosse Rose Series includes three pieces that have three different sides of Grandad Bluff carved on the front. Each Bluff Rose represents a different side of one person, their caring side, their brave side, and their gentle side. We all have many sides to our personality, each one a gift. We are to celebrate the people that we are and uplift those around us for who they are as well. 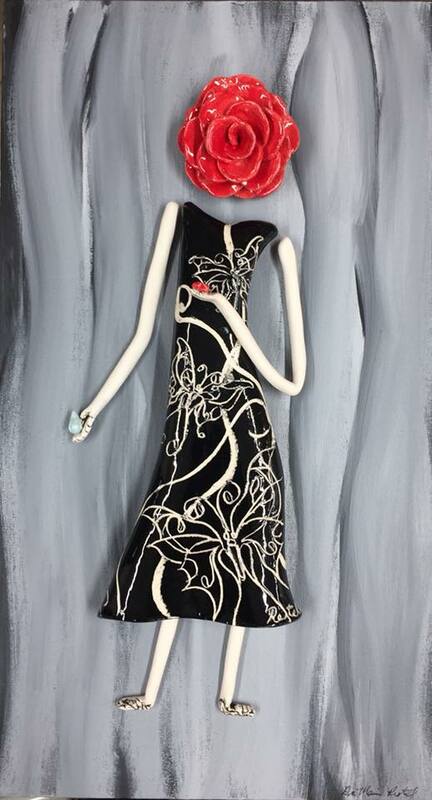 This piece was auctioned off at the Murder Mystery Event supporting the Local Lupus Alliance in 2018. The heart she holds in her hand is for all the love she receives that keeps her going. The tear drop is a recognition that things can be hard, but it is not her focus. The 3 butterflies are the national symbol for lupus. 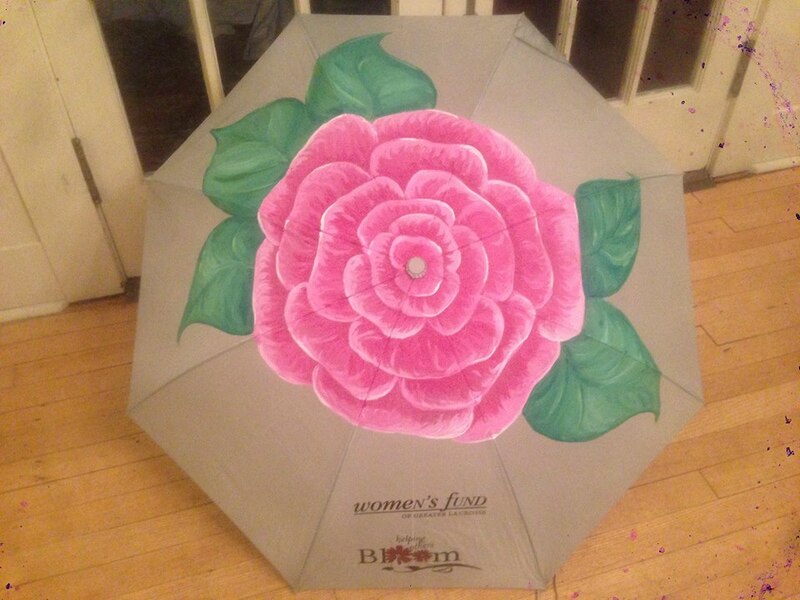 Created and sold as a fundraiser for the Women’s Fund of Greater La Crosse.